A Lebanese agency ran a 'special offer' on migrant domestic workers of Ethiopian and Kenyan nationality, which it advertised by text message over the weekend, according to a report by Lebanese blogger Elie Fares. "For Mothers' Day, indulge UR mum & offer housekeeper. Special offers on Kenyan & Ethiopian nationalities for a period of 10 days", the text message said. The agency's depiction of migrant women as commodities to be traded, while shocking, is far from unusual in the Middle East. In a troubling post on an internet forum in Qatar in 2013, spotted by Migrant Rights, an expatriate who is leaving the country advertises his Indonesian domestic worker. "Who wants an Indonesian maid? I am leaving qatar for good and i have a maid that i would like to leave here and i want QR 10,000 ONLY . She is very clean and well behaved" the post said. As Migrant Rights noted at the time, the post evidences disturbing practices and attitudes towards domestic workers, with employers often perceiving maids as "investments," in part due to high recruitment costs exacerbated by the sponsorship system. 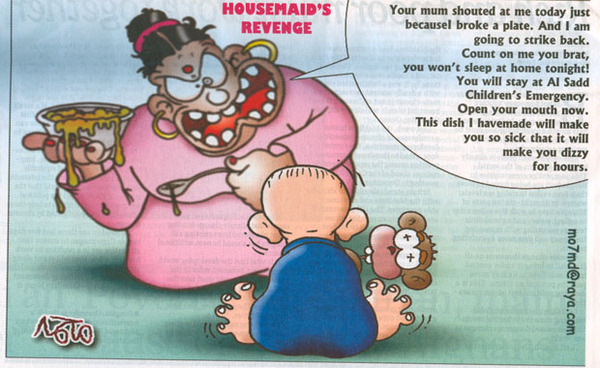 Compounding such attitudes, openly racist depictions of migrant domestic workers are commonplace in the media in the Middle East. Migrant women are regularly portrayed as sinister, subnormal and unclean, and are routinely accused of posing a threat to their employers as a result of their unreasonable 'demands' or latent criminal tendencies. Narratives such as these serve to dehumanize migrant women, and to trivialize the exploitation that they are vulnerable to in the Middle East. This is a subject that Migrant Rights has carried out extensive research on - this post from 2012 details numerous cases of racism in the media, including an infamous cartoon from Qatar's Gulf Times, which portrays a South Asian woman as a demonic, malevolent child-poisoner.